Ten years ago, no one would have ever known the names Forrest Griffin, Rashad Evans, or T.J. Dillashaw. Today, all three current and former champions are synonymous with the UFC and the promotion’s tent pole reality program The Ultimate Fighter. This Friday, December 11, two more aspiring hopefuls, featherweights Artem Lobov and Ryan Hall, will look to join the ranks of TUF’s 21 previous champions. Hanging in the balance, as usual, is a UFC contract and a glass-plate trophy. But unlike any previous seasons of The Ultimate Fighter, Friday’s final features two fighters who have already suffered defeat during the show. Having already spent the better part of the last three years around the UFC circuit, Lobov is widely known as interim featherweight champion Conor McGregor’s training partner and wingman. Soviet born and Irish raised, Lobov, whose first name is butchered by nearly everyone who says it, including McGregor (it’s pronounced Ar-Tyohm, or Aртём for the Cyrillic-reading crowd), trains out of Dublin’s SBG under the tutelage of coach John Kavanagh. A heavy-handed puncher, Lobov amassed an 11-10-1 record prior to his TUF tryout. He then quickly lost during the qualifying stage, dropping a majority decision to Team Europe castmate Medhi Baghdad. McGregor then intervened to bring his boy back into the fold. Lobov is a slugger, and he doesn’t attempt to hide it. The former ballroom dancer made good on his second life on reality TV, recording three straight knockouts en route to the finals. Once the fighters moved into the TUF house, Lobov was the only one to score any KOs during the season, winging heavy shots from the hip to take out Julian Erosa, Chris Gruetzemacher, and James Jenkins en route to the finals. Like his friend McGregor, Lobov is a southpaw. He’s also developing quite a tongue, dropping the rhyme “you can try, but you will fail, because my heart will always prevail” during the most recent pre-recorded episode of TUF. Perhaps that line was scripted; it sounds like one of those catchy phrases McGregor repeats ad nauseam. Originally scheduled to face European teammate Saul Rogers in the finale, Lobov now meets American Jiu Jitsu trickster Ryan Hall, after Rogers was unable to secure a visa to enter the U.S. And, oddly enough, Lobov and Hall were training together in Dublin in preparation for the TUF Finale before the American was tapped as a replacement. 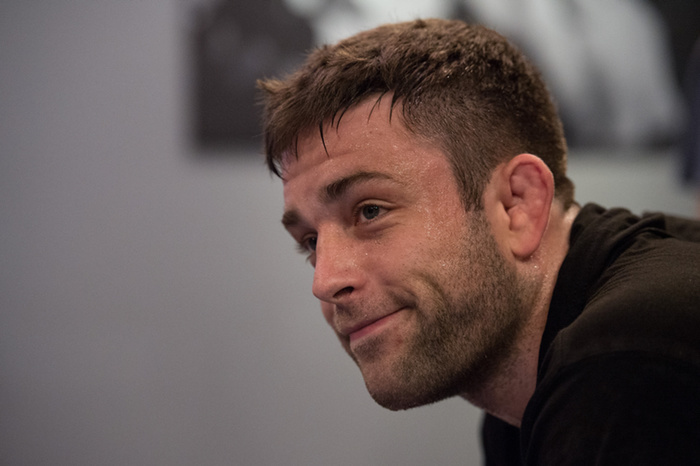 Hall, who recorded two heel hook submissions on the show prior to dropping a majority decision to Rogers in the quarterfinals, represented Urijah Faber’s Team USA on the show. He’s a renowned Brazilian Jiu Jitsu competitor, world champion, and ADCC medalist, who hails from Virginia. Using a vast array of triangles and heel hooks, Hall developed a serious reputation in the competitive BJJ community before turning to MMA in 2012. He also gained viral Internet fame for subduing a belligerent restaurant patron with Jiu Jitsu technique—a combination of double-leg takedown, mount, and rear-naked choke. The date of Friday’s TUF Finale, December 11, just so happens to coincide with the fourth anniversary of that event. Hall trains out of one of MMA’s better-known fight camps, Montreal’s Tristar gym, home to former welterweight champion Georges St-Pierre and coach Firas Zahabi. Prior to TUF he went 4-1 in professional mixed martial arts; he’s on a mission to prove that his risqué form of BJJ is relevant in MMA. So there you have it; your TUF 22 final. It’s striker versus grappler for 100K and the contract. Perhaps one of these two will eventually ascend the ranks and join Griffin, Evans, and Dillashaw in infamy. But more likely, and at the very least, they’ll earn entrance into a very exclusive fraternity of The Ultimate Fighter tournament winners.